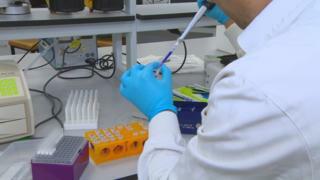 Researchers at the University of the West of Scotland have discovered a protein that can stop viruses developing. The team had already established that the same protein can suppress cancer. Now the fight is on to fully understand how it works in the hope of turning the laboratory research into a treatment. The protein is called Hira. Technically it is a histone chaperone complex, but it is easier to understand in terms of what it can do. Three years ago Dr Taranjit Singh Rai and colleagues at the Beatson cancer institute and Glasgow University reported that Hira could suppress the uncontrolled division of cells that causes cancer. So far, so exciting. But in the course of that research Dr Rai spotted something intriguing. "If you want to study cancer you use viruses to deliver the mutations into the cells," he says. "But every time when I used to use viruses, this protein Hira moved to a new place. Which made me think maybe it has something to do with viruses. "But because I was doing a cancer project it was at the back of my mind." Now working at the University of the West of Scotland, Dr Rai and his colleagues have now established the same Hira protein combats viruses too. There are millions of viruses out there, whose sole purpose is to replicate by getting inside the living cells of organisms like us. The so-called common cold isn't as common as billed as it can be any one of more than 200 different viruses. That is why science hasn't found a cure for it yet. But in the lab they have established that the Hira protein has a role to play in the anti-viral fight. As Dr Rai explains, they did it by using specially-bred mice capable of having the Hira protein "knocked out" of their genome. "The proof of the pudding is when you eat it," he said. "So we had a biological organism in which we could actually switch this protein off wherever we want. "So we switched these proteins off... and these organisms were very prone to herpes viruses." So the Hira protein could have a fundamental role to play in combating both viruses and cancer. Where can we get some? The good news is, we've got it already. Hira is present in greater or lesser amounts in every cell in our bodies. The older we get, the more Hira builds up in our cells, suggesting it also plays an important role in how they age and die. The trick in using it to fight disease may lie in increasing Hira levels in our cells. But to do that a way will have to be found to use a protein which binds extremely tightly to our DNA. "I think what pharmaceutical companies might be interested in is how can we boost levels of this protein," Dr Rai said. "Because if you have more of this protein you can actually tackle the viruses better." Dr Rai has led an international study that involves not just the University of the West of Scotland but the Beatson cancer institute, Glasgow University and collaborators in Cardiff and California. Support has come from Cancer Research UK and the results are published in the journal Nucleic Acids Research. But there is a major caveat here. This is fundamental research, still very much confined to the laboratory. Dr Rai says it's necessary to "step back a bit". "We really don't understand the real cause of the common cold. "You go to a GP and they say 'oh it will be fine in seven to 10 days'. We don't even know the cure for that. "So I think we really need to understand how these viruses operate, how they hijack the cellular machinery. "And what we have found is one big component of that cellular machinery which actually prevents the virus from integrating into the genome." It is going to take some time, probably years, before this work can move out of the lab and into clinics and hospitals. But the researchers are excited - and confident Hira will one day be the basis of a new approach in medicine.